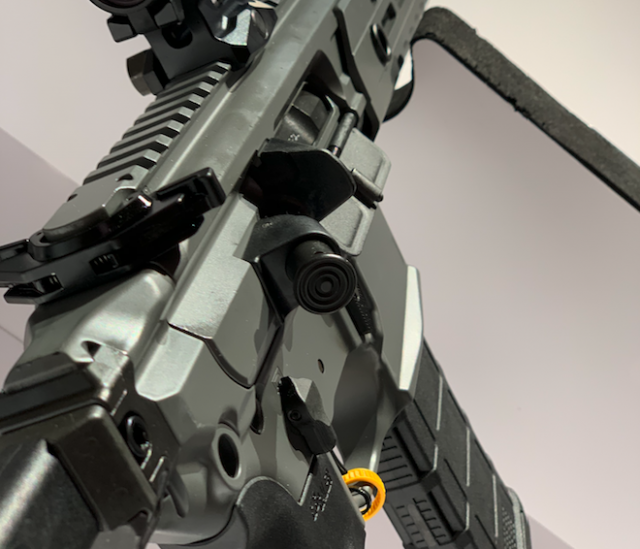 “Wait until you see what we have in store for the SHOT show, our new machine gun is going to change everything,” said Tom Taylor Chief Marketing Officer and Executive Vice President for Sig Sauer. Tom teased Sig Sauer brand Ambassador and CEO of Bottle Breacher Eli Crane and I while we filmed an episode of “The Real Man Show with Kyle Reyes” at the Sig Sauer Academy. In seemingly perfect timing we could hear the new machine gun rattling off in the distance at the off-limits prototype testing range. Tom politely denied our requests to see it in person and promised us it would be worth the wait when it debuted at the 2019 SHOT Show Sig Sauer Industry Day. We continued to pry for details and even a few glasses of bourbon and my trained interrogation skills couldn’t get Tom to break. 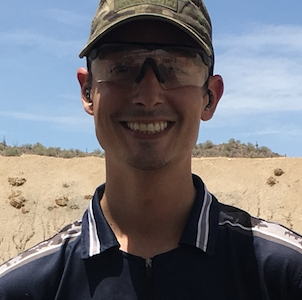 Tom promised Eli some hands on time at SHOT and graciously invited myself and Kyle to attend the range day activities as well. With the event a month away, we all shook hands and said our goodbyes and looked forward to seeing if the hype was everything that was promised. It turns out Tom actually undersold and over delivered the experience waiting for us. From the moment Eli and I checked into the Mirage Hotel and Casino it was apparent Sig was going big this year. The Sig Sauer emblem was plastered across the Mirage lobby fish-tank and outside an all-black charter bus sporting a Sig Sauer logo shuttled us to the Clark County Shooting Range away from the glitz and glamor of the Las Vegas Strip. 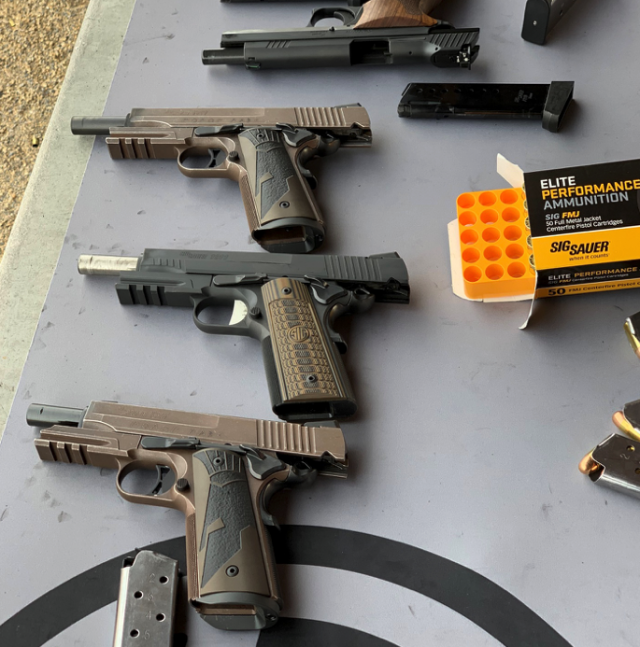 During the ride to the range, Eli explained to me why Sig was hosting its own separate range day away from the official SHOT show event. Sig was such a multi-faceted brand by delivering not only firearms but ammunition, optics, accessories, and a training academy as well. Having so many products to display left them needing more space than available to them at the main range day event. Hence the need to branch out and host their own. When we arrived, we could see a sprawling range filled to the brim with Sig products and demo bays and we quickly ran off the bus like kids arriving at Disneyland. Eli and I met up with Kyle Reyes and his camera crew for The Real Man Show while the range staff quickly ushered us to the main range for what was promised to be an event opening we would not want to miss. 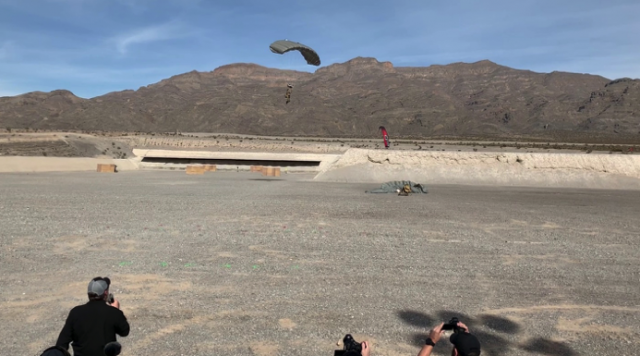 With a large crowd of media and industry movers and shakers gathered, Sig spokesman and former military operator Kyle Lamb took the microphone and directed everyone to look above to the sky. A helicopter hovering above could be seen and suddenly a parachute deployed and then another and another. The jumpers glided to the ground in full battle gear and quickly stowed their chutes and rallied up together to move in a patrol formation towards an obstacle-filled shooting bay. Lamb explained the process with each movement of what a military unit would be doing in such a situation and as the team neared the bay the sounds of gunfire erupted. The team quickly hit the ground and a swarm of the latest high tech interactive and motorized shooting targets approached the team. These $150,000.00 moving targets react to bullets when hit and either slow or outright fall over when hit. As the team disabled target after target, a Suburban sped toward the team containing a quick reaction force (QRF). Multiple operators deployed from the Suburban to provide covering fire as a new swarm of targets appeared. The gunfire was really going now and smoke was deployed to allow the jumpers to make their way to the vehicle and extract from the hot zone. With the team safely secured the Suburban sped away leaving the mechanized force behind and the crowd applauding at the spectacle. Lamb welcomed us all to range day and promised more as the day continued. Eli, Kyle and I moved from bay to bay filming and test firing different platforms. My agency is in the process of transitioning to a p320 X-Carry variant and we optionally are allowed to purchase the new p365 subcompact 9mm as a backup/off-duty weapon. What makes the p365 so exciting to me is that it comes in a diminutive package yet offers 10 rounds as standard capacity with an optional twelve round magazine. Lined up side by side the p365 is smaller than my current Glock 43 and brings a 40 percent increase in magazine capacity. The pistol pointed naturally and shot well and Eli and I were able to make hits with ease at the pistol plates 20 or so yards away. This pistol will definitely be my next purchase and backup duty weapon in the future. Another pistol that caught our eyes was the Spartan edition 1911 that looked like the kind of pistol Leonidas would have carried at the gates of Thermopylae. 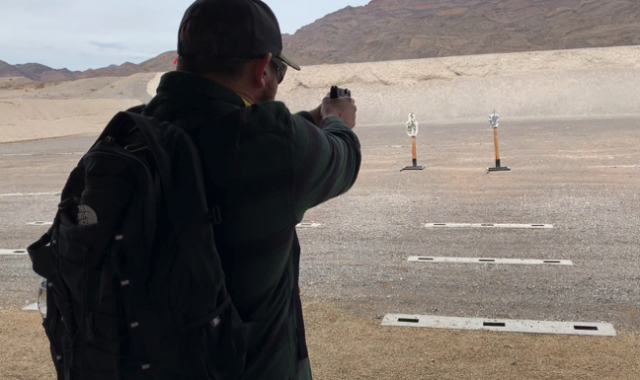 I had spent the previous day shooting the Arizona State IDPA Championships with my 1911 and part of competition shooting is looking cool as much as it is shooting and this pistol definitely had the cool factor turned up. The pistol handled and shot well as 1911’s have for a hundred years. If you’re looking for something that stands apart from the crowd aesthetically and is a shooter, give the Spartan a try. After spending time in the pistol bay area, Lamb called everyone back to the main range for another demo that was unique and fun. Sig’s shooting team consists of pistol ace Max Michel and 3-gun pros Daniel Horner and Lena Miculek. The trio lined up in front of 42 steel plates and Max opted to use a pistol while Daniel and Lena utilized the MPX platforms. An official NRA Guinness World Record official oversaw the event and on the buzzer, the team smoked through all 42 plates in 4.42 seconds and established a new world record! Sig has assembled an all-star team and I’m sure many new records and championship titles will be claimed by them in the future. Lamb promised a grand finale for the event and sent everyone back to the shooting lines to continue demoing products. 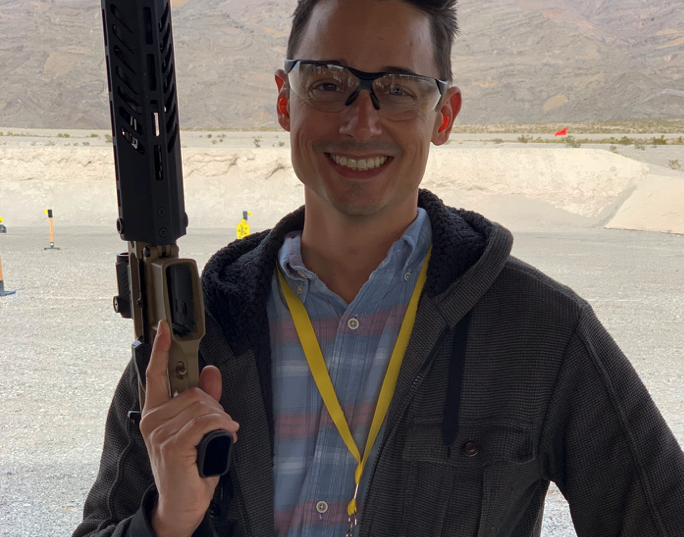 We ran into Sig Academy instructors and friends Dylan Kenneson and Eric Palmer and they walked us through the new suppressor goodness on display. The highlights for me were the MODX9 modular pistol suppressor, the Copperhead MPX Pistol and the MCX Rattler with canebrake. 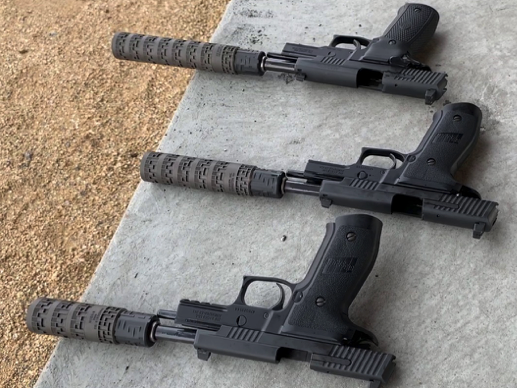 The modular pistol suppressor allows you to easily increase or decrease the length of the suppressor through detachable sections with the trade-off being length for sound suppression capabilities. It was cool to have flexibility in one package and I can see where different scenarios would dictate one length over the other. The Rattler in .300 blackout offered a canebrake which is a faux suppressor that can easily be discarded once your suppressor stamp is approved. 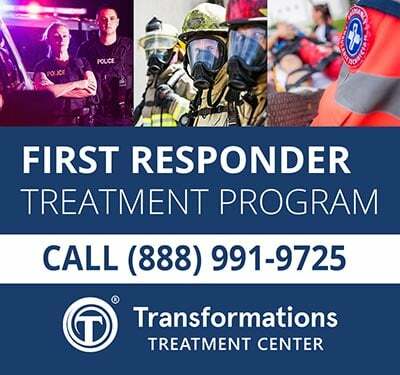 This is a cool little touch that is forward thinking for their customers. The MPX Copperhead is a soft shooting PDW in a tiny package. A weapon like this allows me to carry under my suit jacket on a protective mission or overtly in a compact package that easily allows me to get in and out of vehicles. 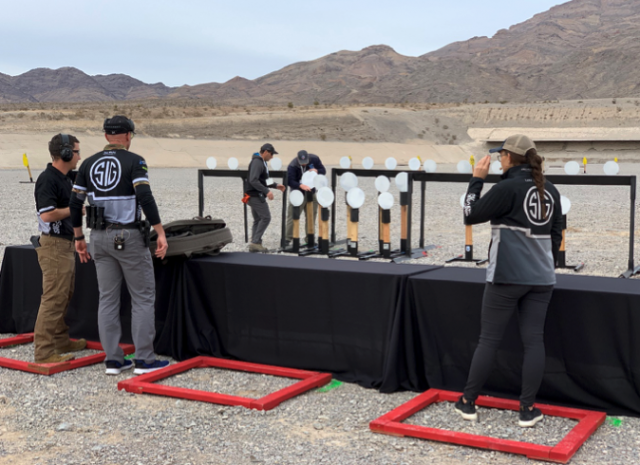 Dylan and Eric did a great job of demoing the weapons with us and if you ever get the opportunity to train at the Sig Academy you won’t meet better-shooting instructors or nicer guys than Dylan and Eric and they’ll take your shooting game to a whole new level. For the final time, Lamb called everyone to the main stage to debut the Sig Light Machine Gun or SLMAG. This was the weapon everyone had been waiting for. As the demo was preparing Eli explained to several of us how he carried the MK48 machine gun in the SEAL teams and the weapon weight and ammo loadout was a constant thorn in his side and took a toll on his body over his many deployments. Right on cue, Lamb promised the crowd a massive reduction in weight in not only the weapon but the ammunition as well. The new SLMAG dropped the weight from roughly 27 pounds of the MK48 to 20 pounds and decreased the ammo weight by 20 percent by utilizing the .338 Norma Magnum. This round brings down felt recoil and increases effective range to well past 1000 meters. As Lamb explained the modular features of the weapon several assault vehicles entered the range and came under fire by the mobile targets. The operators departed their vehicles and began leapfrogging to positions while covering each other from position to position. Once the team had taken an advantageous position the machine gun was deployed sending the powerful and accurate .338 round downrange in a jaw-dropping show of force. The crowd applauded as the demo came to an end and Sig allowed the media and attendees to shoulder the new weapon. Each of us marveled at the weight reduction and Eli immediately commented on how much he wished he could have carried this lighter weight version during his time on the SEAL teams. Even my slim or as I call “tactically agile” frame was able to comfortably shoulder the weapon and carry its weight. To contrast my tactically agile frame, Mark Calaway better known as WWE’s “The Undertaker” shouldered the weapon and made it look like a regular rifle against his massive frame giving everyone a good chuckle. With everyone’s curiosity satisfied, Sig closed the event and offered beverages and refreshments to all attendees and more photo opportunities with the SLMAG. At the reception, Tom Taylor was all smiles after the successful debut and Eli and I toasted him with a glass of whiskey after the long day. Tom had promised us a range day we wouldn’t forget and we assured him he had been a man of his word. 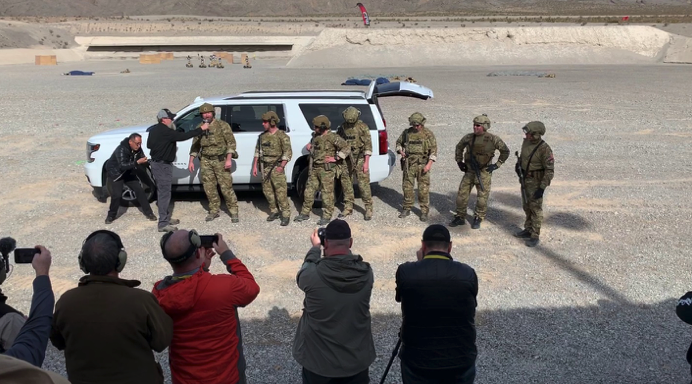 Tom swore we could shoot the SLMAG at the Sig Academy in the future calling for another round of cheers from Eli, Kyle and I.
I’ve been to a lot of range demo days in my law enforcement career but this event surpassed them all in terms of size, scope, products, and professionalism. Eli and I both have entrusted our lives to Sig Sauer platforms in both the military and law enforcement realm and I’m glad to know the people behind those platforms are always thinking, innovating and are more importantly genuine, kind individuals that love what they do. I know when it counts, the Sig on my side and everyone that stands behind it will be there for me and those around the world. 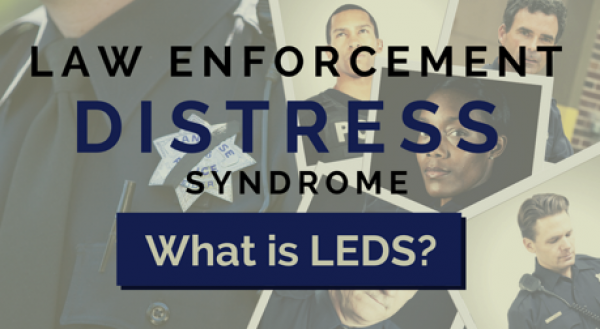 Joshua Fry is a 14-year federal law enforcement officer and is currently part of his agency’s national 3-Gun Team. 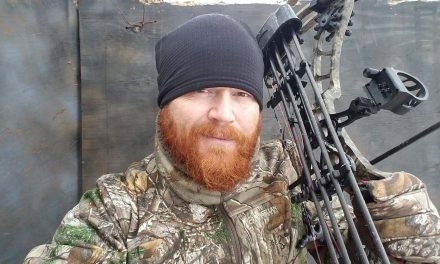 He is a freelance writer covering competitive shooting sports and their equipment, and consultant/producer/writer for the Television and Film Industry. Joshua Fry may be contacted via Instagram @joshuaonefivefry. 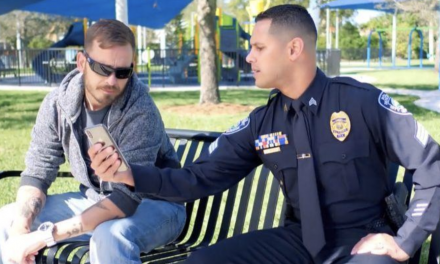 PreviousCannabis Infused Booze – The Next Problem for Police? Joshua Fry is a 14-year federal law enforcement officer and is currently part of his agency's national 3-Gun Team. He is a freelance writer covering competitive shooting sports and their equipment, and consultant/producer/writer for the Television and Film Industry. Joshua Fry may be contacted via Instagram @joshuaonefivefry. 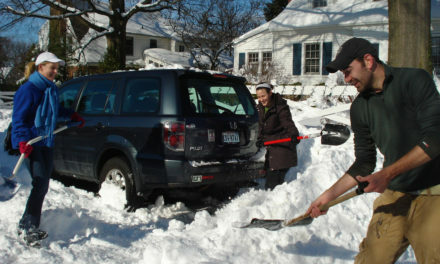 First, This Marine Was The Victim of Road Rage. Then, He Was The Victim Of Red Flag Laws.